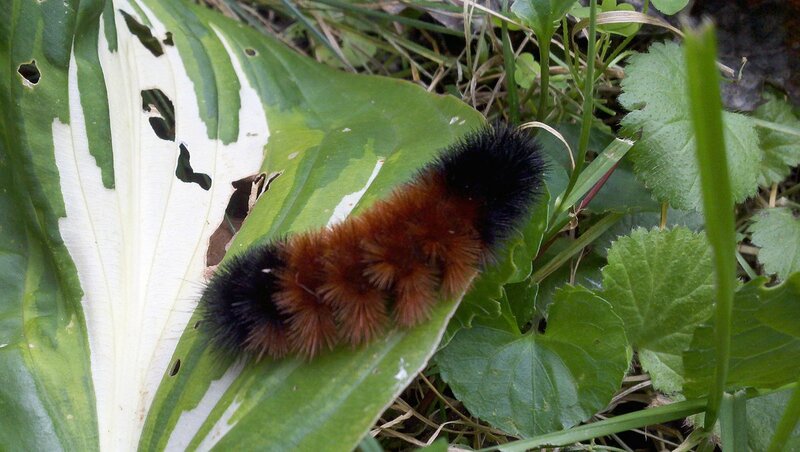 The wonderful Woolly Bear Caterpillar (Pyrrharctia isabella) is a common sight once October rolls around in temperate regions of the United States east of the Mississippi. 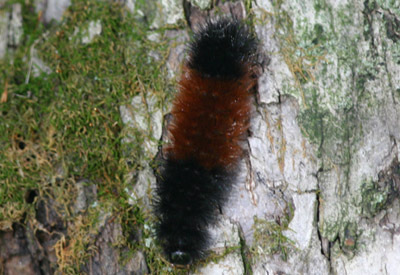 The wooly bear, known also as the woolly worm, fuzzy bear, banded woolly bear, and black-ended bear, is reputed to signal the severity of the coming winter to those who understand the riddle of its bands. This caterpillar is black on both ends with a middle band a birder could only describe as rufous. Woolly bears overwinter under leaf litter in a sort of hibernation. Come spring, they eat lots of foliage in preparation for the big push to their adult phase. Superstition assures us that the amount of rich rust-colored fuzz adorning a particular fuzzy bear is inversely proportional to the length and intemperance of the season ahead. The broader the bear’s black bands, the worse the winter. Of course, reasonable folk realize that this caterpillar is no Cassandra at all. The breadth of a woolly bear’s bands tells us more about the previous season than the approaching one, as its rufous band narrows as the bug gets bigger, which happens when food is bountiful. Other factors such as age also affect the fuzz factor. 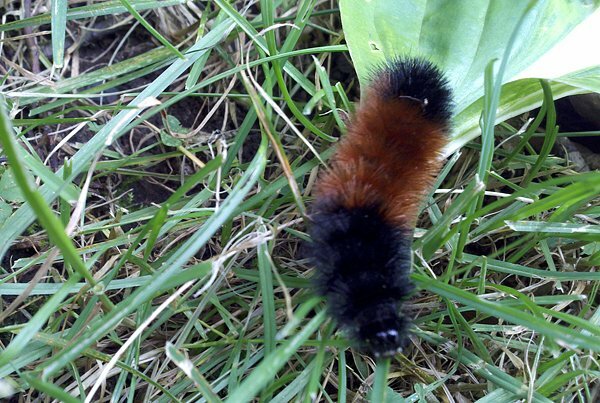 A woolly bear won’t give you a clue regarding the coming cold. 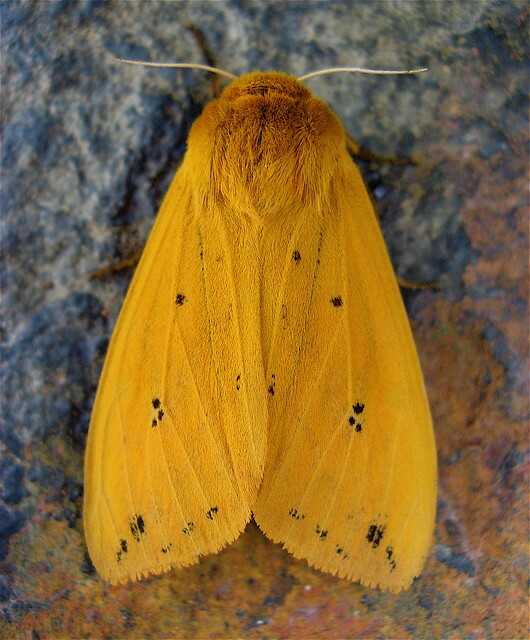 What you might get instead, assuming the larva reaches maturity, is a lovely Isabella Tiger Moth. Thanks for the posting. Our family has found a few in the yard in Connecicut. They are now pets. I know they winter as Woolly Bears, but what can I feed them? We’ve got apple trees maple and oak, and various grasses, but winter is approaching and all I’ll have are pine needles. That’s a great article! Thanks! Last weekend we witnessed dozens of wooly worms all crawling in the same direction like sea turtles heading to the water. I picked one up and turned it around and it turned itself around and headed out with the others. I never saw so many at one time nor witnessed a wooly worm migration before. Is this normal behavior? Where do they go during the winter? I have always wondered that. My 5 year old daughter wanted to keep a woolly bear caterpillar for t he winter. I Goggled it and found a web site explaining how to keep it for the winter. We followed the directions adding leaves and grass every couple of days. We even added a piece of bark for it to sit on. Well now the caterpillar is not moving. We don’t know if it’s dead or gone to sleep(hibernated). How can we tell. My daughter loved taking it out of it’s cup and holding it every couple of days. But now we are just unsure of what to do… Can someone please help. Having the same trouble here – not moving – is he dead or hibernating? Help!!!! i am asking our resident woolly bear expert (in cleveland) for the answer to this question, emily. stay tuned ! I just found a wooly bear in my garage. It is winter right now and I didn’t want him to freeze because it is frigid outside. I know they hibernate, but I was still worried about blizzards and I do not want him to die. I put him in a large aquarium with the last fresh leaves I can find and many twigs. He also has a large rock inside the aquarium, which he really likes to play on. He sometimes tries to get out, but eventually he warms up. It has leaves, grass, and many twigs, and rocks. The lid has tons of holes so air is fine for him. He likes to crawl, but he seems very sleepy. He likes to sleep in the corner of the aquarium (So I nicknamed him Sleepy). He is in my bedroom on a dresser not too close to the window. He seems pretty happy and content, but why is he so sleepy? Is it because they hibernate? Should I just leave him alone and let him sleep… Or should he be more active? I’m afraid that there will be no more fresh leaves, and he refuses to eat the fresh ones I already have. He will climb on them, but I don’t know why he will not stop and nibble. Maybe he isn’t hungry? Please reply to me when you can, because I am getting a bit worried! he is likely sleepy because he wants to hibernate. he also won’t eat much as hibernation comes on. if he is eating, he needs fresh leaves every day. I have a woolly carterpillar in my garage-basement, and it is still alive but I would like to feed it and keep it comfortable until I can put it out in the spring. Any suggestions? Please hurry, as it is very sluggish and barely moving at all. There are usually a few of these catapillars in MA where I live. It seems one came into where I live twice for shelter/hibernation. I decided to take care of it for a while and feed it lettuce, brocolli, carrots, pepper and corn. I gave it drops of water occasionally for moisture. Without fully knowing what to do, it appeared that was the right thing to do since I knew that catapillars eat vegetable matter. I found out it eats clover and grass; needs twigs to to climb and pupate. I have been taking care of this type of Caterpillar for a couple of days now, me and my brother found it on our porch in the snow. We have a home for it, but don’t know what to feed it, and if it should be kept in a room with a colder temperature. It is not moving and I would like to know if that is normal, and what I should do to make sure this little guy is taken care of. Thanks! sonney, take a look at the comment just above yours (by alan j on jan 31) and my comment on dec 19th (where i list 4 links). Its probably best if, like all other things in nature, that you look at its beauty, smile and wish it well, but leave it alone so it can live its life without inturuption. Woolly bear caterpillars have an anti-freeze in their cells that keep the cells from freezing and rupturing during hibernation. I believe their heart and breathing cease as well. But when winter’s over and things begin heating back up, they thaw out and continue on their quests to become moths. In more frigid climates, the period in which the caterpillars can feed is so short that they don’t have enough time to consume enough energy to fuel the metamorphosis. There have been cases wherein it’s taken 14 winter for a caterpillar to finally be able to metamorphose. 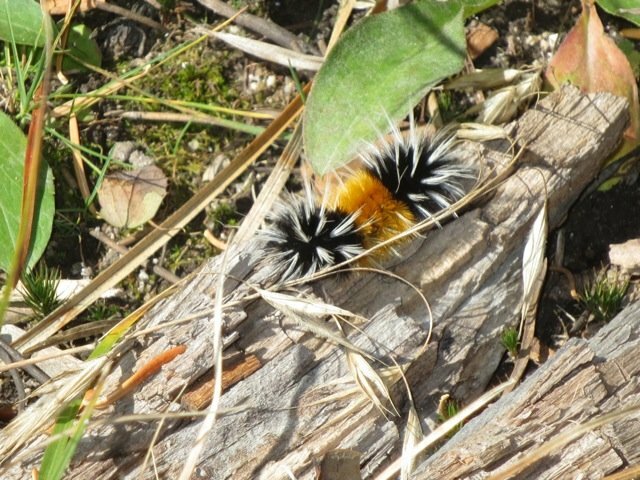 During the last several weeks wooly bear caterpillars have been crossing the roads in our area. In almost every case the caterpillars have been crossing at 90 degrees to the road which would indicate some navigation skill, otherwise the caterpillar would be heading in random directions over the expanse of pavement (as I assume the road appears from one millimeter above the surface). Are you aware of this and what could the navigation system be? I bought a mum this October and one day discovered that a portion of the flowers on my plant had been eaten. I looked a little closer and there was a wooly bear caterpillar. So I left him be to eat and do what a wooly bear caterpillar does. Now my mum has died and I am afraid to throw it away because of the caterpillar. I cannot find him anywhere in the plant. What should I do? I want the caterpillar to be okay, but I also want to get rid of the dead mum in my living room. Thanks! I was walking my dog and on the path back home, i scared about 5 birds trying to pry mr WB out of his winter hideout. Being relentless as the birds are, i had to save mr wb from his almost unfortunate doom. I do know they love greens, what would be the best fresh greens i could get him until his habitat grows? or should i remove him from safe spot outside it’s trying to warm late winter… warming fast so he’s in the refrigerator now. I remember having one found him late fall my mother told me he has to be put outside or keep him in the freezer until spring. The last photo (the brown caterpillar with the white hairs) is not a banded woolly bear caterpillar (Pyrrharctia isabella) which turns into an Isabella Tiger Moth. Instead it is the caterpillar of the Spotted Tussock Moth (Lophocampa maculata). As far as I understand these 2 are in the same family (Arctiidae) but are in different genus and species. I am pretty sure about this but of course could be corrected.